Shapes (D1…D120), in particular isohedra of all types (Platonic solids, Catalan solids, dipyramids, trapezohedra, prisms, anti-prisms etc), plus spherical and other dice. · that the numbers 1-2-3 on a tetrahedron are almost always printed in clockwise? · there are 16 different ways to print 1..6 pips on a die? · how many different configurations for D8, D10, D12, D20 and D30 are available? Dice with special numbers or pips. ”Regular” dice (Dn) come with numbers 1..n, some with 0..n-1 (e.g. D10: 0..9). However, there are many dice with other numbers, e.g. non-transitive dice, Sicherman dice, cheaters, and others. Dice as random number generators. 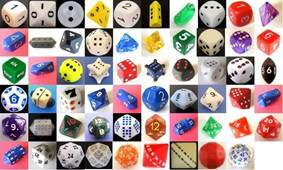 The main purpose of dice, apart from being collected, is to generate random numbers. 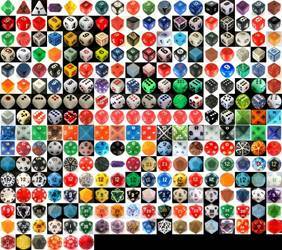 This section shows my collection of such number generators based mainly on isohedral shapes. For a desired range of random numbers (e.g., 1..4), there are often various shapes possible: tetrahedron, square prism, octahedron with the numbers 1..4 printed twice, dodecahedron with 3 x (1..4), etc. In order to keep my effort within reasonable (?) 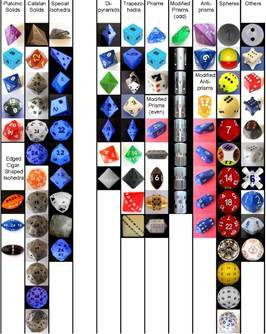 limits, I am interested neither in the color nor the material of the dice, and I prefer standard sized dice (16mm). 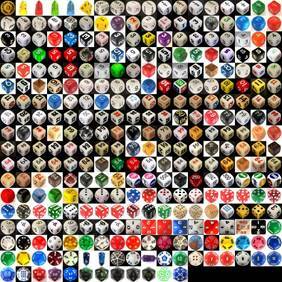 Various dice, some of my wanted dice and duplicates I am ready to trade can also be found on this website.